It was one of those days where there was no major Hollywood blockbuster movie premiering in the Indonesian theater on a Wednesday, so my wife and I ended up watching a movie that I was quite interested to see. I saw portion of the trailer to this Japanese movie few days ago and was immediately intrigued by the cool action sequences, despite not having a clue at all of what the movie was about. Anyway I convinced my wife to see this one in CGV Grand Indonesia by utilizing some of the CGV cinema vouchers we had from the CGV cinema opening event in JGC and watching the movie Message from the King. So let us move on with the movie. It was told that in Japan, there were some people who due to some reasons were not able to die and they were called Ajin/Demi-human. A young man named Kei Nagai (Takeru Satoh - Rurouni Kenshin trilogy etc) was one of those people who was probed and analyzed like guinea pigs in a Ajin research facility managed by government. The facility was headed by Tosaki (Tetsuji Tamayama - Lupin the 3rd etc) who was always accompanied by a woman named Izumi (Rina Kawaei - Sailor Zombies etc). 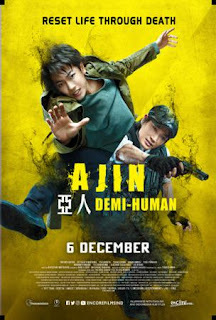 Meanwhile there were other Ajin led by Sato (Gô Ayano - Twisted Justice and voice of Nyx in Japanese version of Kingsglaive : Final Fantasy XV etc) with his loyal right hand Ajin named Tanaka (Yu Shirota - The Prince of Tennis, GTO: Great Teacher Onizuka TV series etc). Sato was an Ajin whose main intention was to show the world how they were the victims of governments' lies but apparently he had other hidden motives. He would later on enlisted the help from other Ajin, including Okuyama (Yudai Chiba - Final Fantasy XIV: Dad of Light TV series) who happened to be a very good hacker. Nagai who never wanted to become an Ajin in the first place was caught up in the fight between Sato's group and Tosaki's government backed armies. Things were not getting any easier for Nagai who still had to take care of his sister Eriko (Minami Hamabe - Let Me Eat Your Pancreas etc). So could Nagai be free from all of this and leave peacefully as he wanted? Find them all in this awesome action movie. Now this is an action movie with an unusual hero. The movie was adapted from manga series written by Gamon Sakurai. The plot was actually not very complicated, and the way the movie was told was quite easy to understand. The pace of the movie was going quite fast. In the first 15-20 minutes we would be shown how the Ajin were treated so inhumanely and we could immediately relate to the Ajin. The action sequence during that time were top notch. Can you imagine fighting people who could not die? They would just reset (die and awake in few seconds) and would be able to fight again. That was the whole point of why the movie was unique and awesome, cause the good guys have to use their wits to be able to defeat the Ajin. Apart from the totally wonderful fight sequences, the movie was also having quite good CGI effects when the "ghost" that apparently appeared from the Ajin showed up. The fight scenes involving these "ghosts" were great. I think all the fight scenes were quite breathtaking and greatly done. My favorite would be the ones during the middle part which involved the huge special squad from the army and of course the climax fight sequences. As I mentioned above, the movie was not difficult to understand and I think it was a very plus point. Sometimes a movie adapted from something that we are not familiar with tend to drag on the explanation part (and even then we still would be having difficulty in understanding). But this one was easily enough that I did not even feel the urgency to read the manga or watch the anime series to better understand. If anything, those would be just supplementary to me rather than a necessity. I also think that Takeru Satoh was having good martial arts skill. It certainly did not hurt to have the famous Ruroini Kenshin movie trilogy to Satoh's belt (Kenshin was also adapted from Manga and told the story of samurai with many fighting sequences. Definitely must find the time to see those movies). While Gô Ayano was also quite convincing playing the antagonist role and his fighting skills were amazing to see as well. The sound effects for this movie was pretty good with several good music to accompany during the tense moments. There was no post end credit scene in this movie, in case you are wondering but the song played while the end credit was shown was quite nice (a typical Japanese rock song that lifted the spirit). Bottom line, this is an unusual unique action movie with a bit of a fantasy and very worthwhile to see if you want to take a break from Hollywood superheroes movies. Give this one a try and I am pretty sure you would be able to enjoy this movie just like my wife and I did. Btw, my wife was able to spot/deduct 1 or 2 things that I did not noticed earlier. Perhaps you could see them too?